Spacious Sea Front Apartment - Sleep Over The Beach! Cortijo Blanco, a Sea front complex, is pleasantly situated near Puerto Banus, in the secluded, residential Cortijo Blanco area, one of Marbella's most established suburbs. It has a large garden and is only a few minutes walk from the hotels, bars, good restaurants and a supermarket. This beach front apartment is located on the 2nd floor of the Cortijo Blanco building, directly overlooking the beach and Mediterranean sea. The apartment has access to the adjacent beautiful Alabardero beachside swimming pool and recreation facilities and access to sunloungers and umbrellas by the swimming pool and those by its lovely Playa. You can also enjoy its beachside taberna with fantastic tapas and open-air, on the beach, massage services. The 2 well known and exquisite beachside fish restaurants (Nueve Reino and Alabardero) are just adjacent to the Cortijo Blanco Apartments and many other fine restaurants are located on the San Pedro promenade within a very short walking distance. The apartment is air-conditioned. 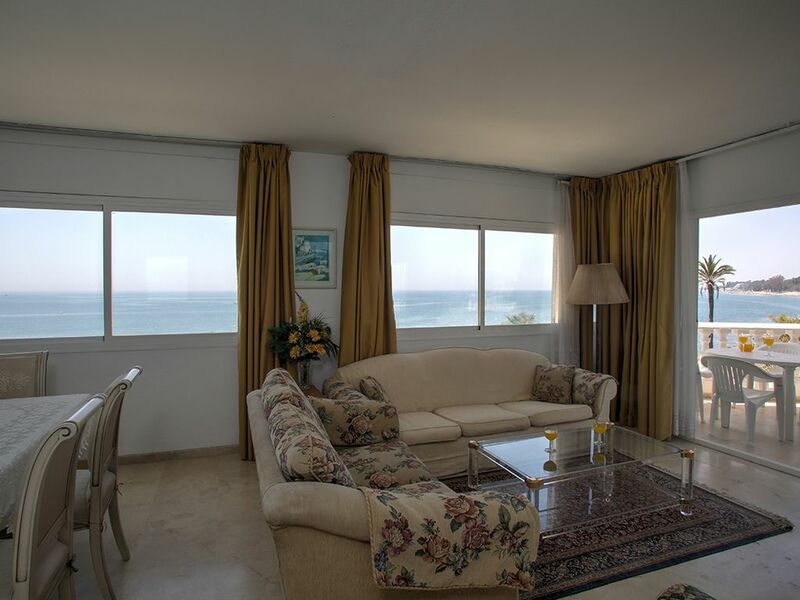 Living room with terrace, directly overlooking the beach. Separate dining room, also with terrace and seating area overlooking the sea. Fully fitted kitchen with dishwasher, washing machine and dryer. Notes on accommodation: Pets not allowed. Cleaning / Towels / Linen / Maid service: Linen is provided. The Kala-Kalua water sport facilities with jet skiing, pedal boats, para-sailing, banana boats and others are on the door step of the Los Pinos Beach front apartment. The beautiful san pedro beach and its palm planted promonade is within 5 minutes walk. The apartment is also located within 10 minutes walk to CoCo Beach and Mistral (no stress) beach in Puerto Banus, and their respective recreation and sport facilities. Malaga and Gibraltar airports are a 40 minute drive. The pleasant, white washed, Andalusian town of San Pedro is only a 3 minute drive in one direction while a similar distance in the other direction is Puerto Banus with its restaurants and night life. Several golf courses lie minutes away by car. There are many activities in the area including golf, tennis, cycling, swimming, snorkeling, diving, boating, sailing, waterskiing, windsurfing, parasailing and jet skiing.